Time to upgrade your entertaining or area but want to know more about Homeshield’s flyover patios Brisbane North? 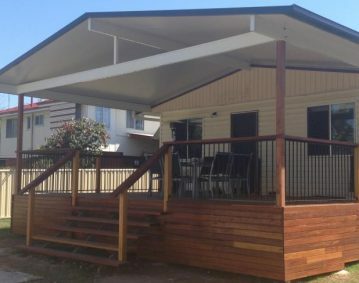 Family owned and operated, Homeshield has been designing and installing comfortable yet functional high-quality patios and decks for Queenslanders for more than 60 years. 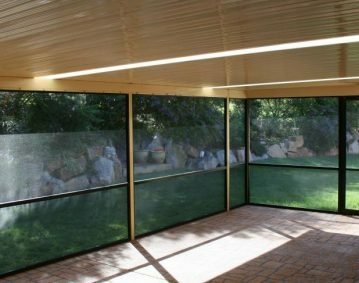 Your experienced Brisbane-based Homeshield patio designer will develop a tailored patio plan that takes into consideration all your options and best suits your home and brief. Call our friendly team today on (07) 3216 2799 or enquire online here. Do you like the idea of a flyover patio roof but you have heard they let too much water in when it rains? You may be surprised to hear, when done right, this isn’t the case. Here is a flyover roof our team recently installed on a house at Carseldine. As you can see, rafter brackets allow the height you require for natural ventilation but also ensure that there isn’t too much rain or wind getting in to spoil the party for you. So you have made the choice to go with a flyover patio roof for your home. The next big decision is to choose the right patio builder North Brisbane to guide you through the process. 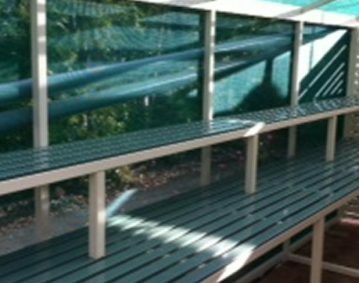 We are the only patio and deck builders in Brisbane who help you get exactly what you want. We offer real, tailored designs, with the combination of great service, product range, knowledge and reliability. Whether you already have an idea in mind or you are starting from scratch, we custom design an outdoor space to suit your property and your needs. We ensure that you get a great choice of the best products from multiple manufacturers with real, itemised quotes. Flyover patios are breezy, modern and create a sense of space because of their increased head height and are becoming hugely popular across Brisbane North. So why not add one to your home today? Call us on 3216 2799.